Unleash your creativity for less with this early Amazon UK Black Friday deal. UPDATE: this deal has now ended. See our article on the best drawing tablets for more top deals. Unless you've been hiding under a rock somewhere recently, you'll know the best Black Friday deals are just around the corner. But you lucky lot in the UK can grab a bargain earlier than you thought. This week we've seen some amazing early UK Amazon Black Friday deals for artists and designers, and none more so than this impressive saving on one of Huion's most popular graphics tablets. When it comes to bagging yourself a quality graphics tablet, Huion products, which are both powerful and affordable, have become a firm favourite among the creative community. So today we were super-excited to see this early Black Friday UK deal, which knocks a whopping 20 per cent off the retail price off the Huion KAMVAS GT-191 drawing monitor. 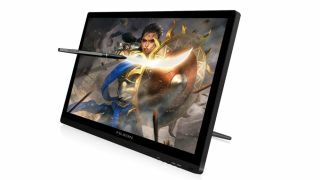 Sporting a sleek 19.5 HD IPS display, with a 1920 x 1080 full HD resolution, the Huion KAMVAS supports an impressive 8192 levels of pen pressure. To put things into context, that's the same as the pressure levels in the new Wacom Cintiq Pros. The KAMVAS also comes with a stand, which can also be detached if you'd prefer, and a pre-attached screen protector too. At full price, the KAMVAs is great value for money, coming in at roughly a third of the cost of a top line smaller Wacom Cintiq Pro, but this added saving makes it an absolute steal. This deal is available now to Amazon Prime members, however non-Prime members will have to wait an extra 30 minutes to get their hands on the goods. Don't want to miss out? Sign up for a free 30-day Amazon Prime trial and get access to every deal as soon as they appear! The Huion KAMVAS model not quite right for you? Never fear, we've got the best graphics tablets to suit all needs and every budget.